A loop is a rope attached to itself. A hitch is a rope attached to an object. And now, a bend is a rope end attached to another rope end. Bends are designed to join two ropes. A good bend will hold two ropes together without slipping. That much is pretty straightforward. Strength- Any knot weakens a rope, but some do this more than others. Ease of tying- When you are on a cliff face and need to attach two ropes, you probably don't want to use one that takes more than a few seconds to tie. Ease of untying-In some situations, lack of speed can mean a loss of money or a loss of life. Diameter of ropes- Not all bends allow you to attach a large diameter rope to a small diameter one. Can the line be shortened while in the knot?- or will you have to untie it and start again? Are You Ready for Some Alliteration? Here are 5 bends, each performing a unique task. They have all been nicknamed, because why not? Learn them. It's time to stop making bad bends. A square knot is not suitable for use as a bend, but you'd be surprised by how many people attempt to join ropes together by tying two overhand knots. 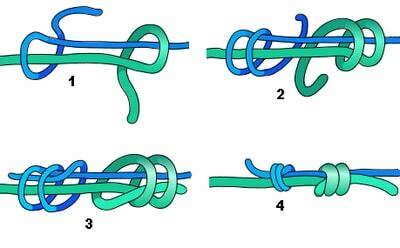 No matter what direction those knots are tied in (overhand vs underhand), they do not form a secure bend. 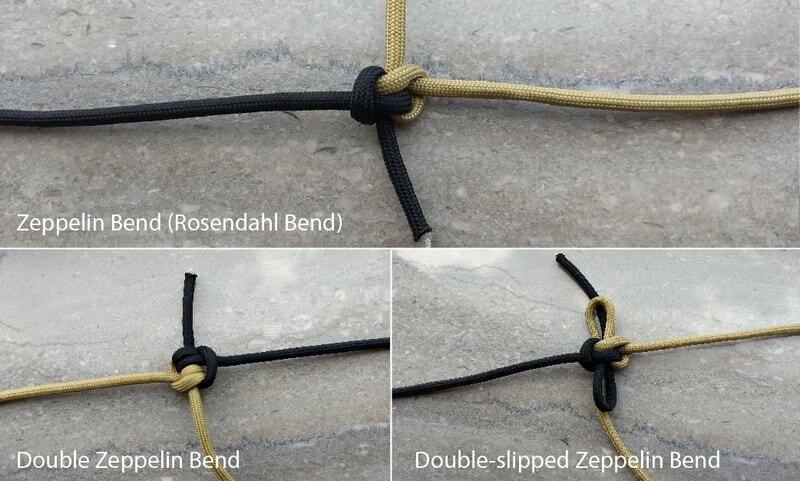 Don't use a square knot as a bend—it will not hold! To the untrained eye, this may appear nearly identical to a square knot, but there is one small difference: the sheet bend works! It should be noted that this bend is for non-critical use as it can still tend to roll under a heavy load. A major advantage to the sheet bend is that it can be tied between ropes when their diameters are very different. 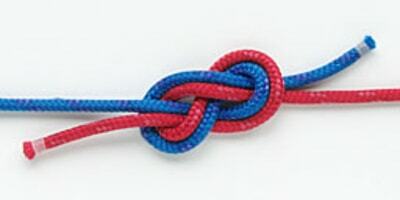 A form of this knot is used to attach a climbing rope to the climber's harness (usually called the figure 8 knot). 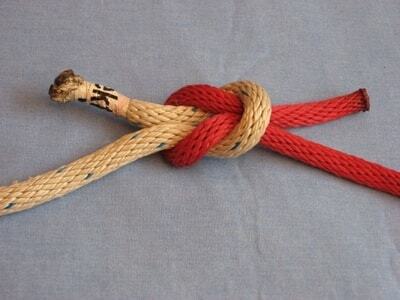 This knot, used as a bend, is one of the strongest and most reliable. It is tied by forming a figure 8 knot, and then following it through in reverse with the other rope. This is arguably the strongest method of joining two ropes. The downside is that it is incredibly hard to untie, especially after being subjected to a load. This is the ideal knot for making climbing prusiks and for other semi-permanent rope joining purposes. In essence, this bend is two double overhand knots tied around each other's standing ends. This is an unusual one. Named after the flying airship, which was in turn named after its designer, Ferdinand Graf von Zeppelin, the story goes like this: To anchor a zeppelin to the ground, they needed a knot that was 1) Easy to tie, 2) Easy to untie under heavy strain, and 3) Extremely secure. The writer of this blog is still getting the "easy to tie" part down, but the design is truly simple. Form a loop with each cord, and stick the working end of each through the stacked loops. 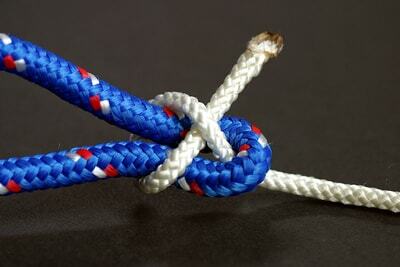 Today's comment questions: Have you been guilty of trying to use a square knot as a bend? Have YOU ever invented a knot? I thought knot. 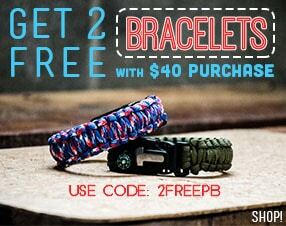 Comment to win 550 paracord this week! 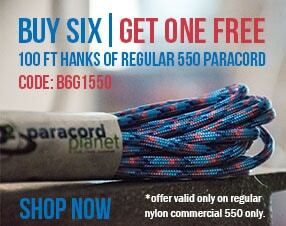 Last week Kyle and Arthur each won 100 ft. of 325 paracord.